Have yourself a very furry Christmas. 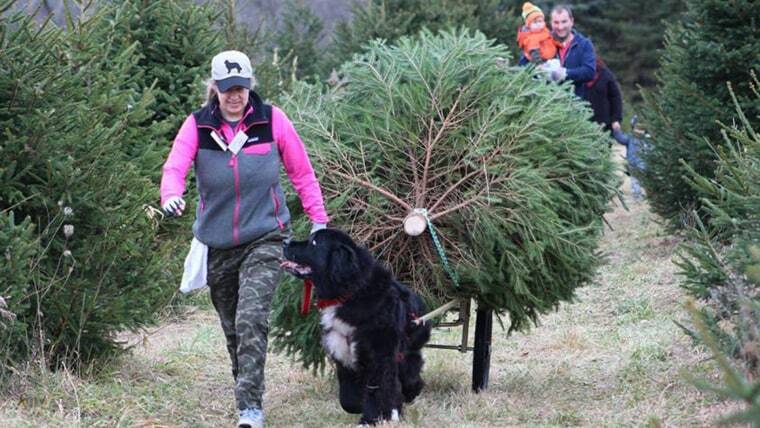 At this family-run Christmas tree farm in Pennsylvania, for one glorious day per year, you can have your tree delivered by dog-pulled sled. Lindsay Eshelman, whose parents, Gregg and Brenda Eshelman, founded Plow Farms in the early 1980s, told TODAY that Newfoundlands weren't part of the original business plan. But in 2001, the family got its first Newfoundland dog. Now they've got three of the "gentle giants," as Eshelman calls them — Lillie Bell, Stella and Matilda — who are regulars at the farm, and big hits with visitors. Last year, Plow Farms began hosting a now-annual gathering for dozens of Newfies (along, of course, with their people) in the weeks before Christmas. That's when the dogs get hooked up to sleds that are custom-built to carry the trees. Eshelman explains that only dogs who've been trained in "draft work" — meaning they aren't new to pulling carts and sleds — can participate. "Dogs must have a draft certificate to pull, meaning they have been through multiple classes and training, so they know all of the commands and how to properly execute the exercise," she said. "Outside of being in the fields, our dogs live in luxury, and we can assure if they didn't want to work, we would gladly let them lay around the fire." We know you like stats, and we do, too: The carts are about 50-75 pounds. The trees are some 5-8 feet long. The dogs, who range from 120-160 pounds, pull the trees around 100-200 feet. We also know you love dogs, and we really, really do, too, so we checked with the American Veterinary Medical Association to make sure this activity is kosher. Spokesperson Michael San Filippo said that while you would always want to be extra careful to ensure a dog isn't overexerted or suffering from some injury, "the dogs seem to be appropriate for the task and don't appear to be struggling or stressed or unhappy." "In this case," he added, "nothing appears problematic. It's pretty cute!" Want to see that cuteness for yourself? Next year's event is already on the books — it's scheduled for Dec. 8, 2018. Meanwhile, Eshelman encourages folks to come by Plow Farms any time they like between now and then, to "pet the dogs, sit by the fire and enjoy a hot chocolate."